Update: Version 3.6 is available, which fixes bugs found in version 3.5. 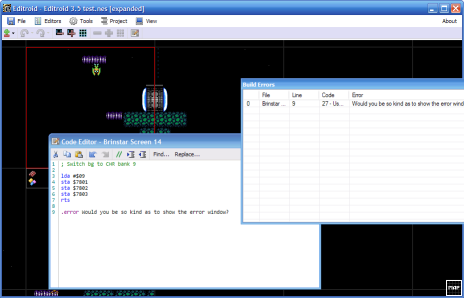 Time to release a new version of my Metroid editor. This version allows you to add ASM to each screen that will run when the screen loads. It includes a built-in assembler so you can do everything right in Editroid. This makes it easy to do things like bankswap graphics for different areas of a level or change music for different areas, or to load additional objects into the screen based on a condition, or change the lava height in different screens so it doesn’t have to be right at the bottom in every screen. So yeah… all sorts of stuff. This is an alpha version, meaning everything is implemented and works, but hasn’t been tested and debugged too thoroughly, but I’ve been using it without any problems. Before you start adding ASM, the ROM needs to be expanded (under the file menu), and then you can click “Create Project” in the project menu. Then, everything ASM-related can be found in the project menu. Check out the RHDN Editroid page for the most recent version. Here are some examples of code you can add to a screen to do nifty things. ; This is required by the above example. ; This would be placed in the general code file. sta $0E                         ;Store object position byte(%yyyyxxxx). lda CartRAMPtr+1                ;(start at beginning of the room). lda $0E                         ;Reload object position byte. tax                             ;Transfer it to X, prepare for loop. ;does not need to be calculated. *      lda CartRAMWorkPtr              ;LoW byte of pointer working in room RAM. adc #$40                        ;Advance two rows in room RAM(one y unit). inc CartRAMWorkPtr+1            ;in room RAM. bne --                          ;Repeat until at desired y position(X=0). *      lda $0E                         ;Reload object position byte. and #$0F                        ;Remove y position upper nibble. asl                             ;Each x unit is 2 tiles. sta CartRAMWorkPtr              ;Add x position to room RAM work pointer. inc CartRAMWorkPtr+1            ;pointer, else branch to draw object. ;on the room RAM which will eventually be loaded into a name table. lda (RoomPtr),y                 ;the index into the structure pointer table. tax                             ;Transfer structure pointer index into X.
lda (RoomPtr),y                 ;the attrib table info for the structure. sta ObjectPal                   ;Save attribute table info. txa                             ;Restore structure pointer to A.
asl                             ;*2. Structure pointers are two bytes in size. lda (StructPtrTable),y          ;Low byte of 16-bit structure ptr. lda (StructPtrTable),y          ;High byte of 16-bit structure ptr. jsr DrawStruct                  ;($EF8C)Draw one structure. lda #$03                        ;Move to next set of structure data. jsr AddToRoomPtr                ;($EAC0)Add A to room data pointer. beq +                           ;If so, branch to exit. Wow, you have done an amazing work with Editroid, I absolutely love it! Expanding the rom completely puts hacking NEStroid into a new realm. I checked out the rom data in TLP and noticed that the graphics was dublicated several times. Does this mean that it’s possible to draw additional graphics to these new graphic offsets?